I got outdoors a lot over the long weekend—rowing and bicycling, and the hot weather was just right for the swimming pool. My daughter and her husband came down from Cleveland to visit. Their Labradoodle puppy still hasn’t quite figured out how to walk up the pool steps, but at least he has discovered that he can stand on the bottom step and leap out of the pool. There wasn’t really much time for blogging, which was okay until an annoying self-critical part of my subconscious began to draw unfavorable comparisons to my creative output in the past. Maybe you’ve lost your mojo, it suggested nastily. You haven’t written much in months. What happened to the days when stories just popped into your head all the time, no matter how busy you were? At first I tried to dismiss the voice, but then I started wondering—did I really have that much more creative energy in the past? Maybe this was just selective memory playing tricks on me, highlighting times when my younger self bubbled over with new stories, while skipping over the mundane stuff. How would I know? Then it occurred to me that an imaginary visit with one of my younger selves might help me find an answer to that question. I decided to call her Butterfly because there was a time, many years ago, when I pictured one as my animal spirit guide, carefree and flitting easily from one place to another. I tried to construct a mental image of this younger self sitting comfortably with a pen and notepad in hand, busily scribbling away. She had her own ideas about that, however. The comfy chair stayed empty; and when Butterfly finally showed up in my mindspace, she was pedaling cheerfully along on a three-speed bike from the 1970s, with her bell-bottom jeans rolled up so they wouldn’t catch and rip on the chain. “Hello,” I said to my younger self, as we rode slowly along a quiet, shaded path in the park. The fast-paced real world seemed very far away. I stopped next to her, and yes, the flowers were pretty—wild roses and honeysuckle all tangled together like a bright, living curtain that swayed gently in the breeze. “Manage distractions?” she repeated blankly, as if I’d been speaking in a foreign language. Then, apparently losing interest in the flowers, she hopped back on her bike and pedaled briskly away, leaving me to catch up with her. After we rounded a curve, a straight, level pathway stretched before us, cool and pleasant in the shade of the overhanging trees. All I could hear was the chirping of the birds and the humming of our wheels. Butterfly, whose attention now seemed to be focused mainly on a woodchuck munching clover on the other side of the path, didn’t answer; but I thought I saw a little smile forming as she glanced away from me. HI! Good to see you back! Great about getting so much sunshine and outdoor time though. Never have to apologize for that! Thanks! Sometimes my younger self gives me good advice, and other times I have to sort out her anxieties instead, but it’s always interesting to see what turns up! 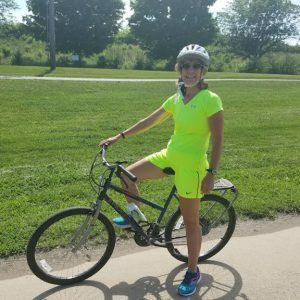 Very snazzy lime green or yellow biking outfit. You are a very stylish cyclist! Love your discussions! Always interesting…and yes, creative too.